What does a resilient charity look like? Measuring resilience in charities is a challenge. In reality, whether a charity is resilient can be known only in the future, and only when a charity faces difficult or changing times. But what does a resilient charity look like? 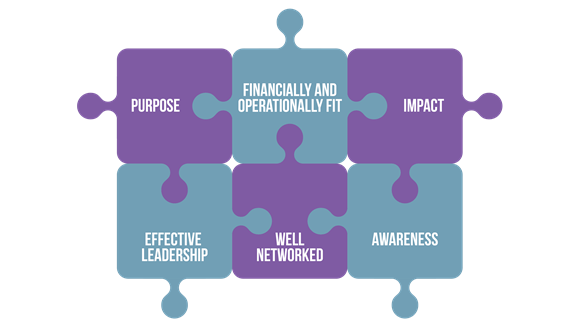 Through CAF's work with charities they have noticed six characteristics that show an organisation has the potential to be resilient. • Understand what your purpose is, and just as importantly what it isn’t. CAF worked on this with one charity in particular, whose work felt very disjointed. They could tell them what they did, but not what they were trying to achieve. This is a situation you need to avoid. In CAF's experience, a theory of change workshop can be extremely valuable in galvanising an organisation’s focus on their resilience. It allows shared time for everyone to focus on the bigger picture. • Awareness of the political, economic, local and national context you work in, regularly horizon scanning for challenges, threats and opportunities. An example of this is a charity that CAF worked with recently that supports young parents. The staff had understandably been too busy with vital delivery to spend time looking at who else is working in this space. However when they did, they quickly realised that many of the charities and projects they knew of had significantly shrunk, closed or widened their beneficiary group beyond young parent families. This surprised the charity. They realised they are now the largest UK charity focused solely on this client group. They became aware of risks and opportunities they had not previously seen. • Effective leadership with trustees and staff who look at the bigger picture as well as the day-to-day. It’s not uncommon for a charity which has grown organically to find they do not have a fully functioning senior management team. CAF have worked with several where there is a CEO and perhaps one person responsible for finance, but all other roles are devoted to (and funded by) delivery. CAF rarely consult on leadership alone, but we often find it’s a key ingredient in many problems we’re asked to address. At a certain point in a charity’s growth, they run the risk of moving into a cycle of constant trouble shooting and ‘bunkering down’ rather than developing. Often CAF find the CEO is wearing too many hats and doesn’t have the time to work strategically. • Well networked and able to get support from and work in partnership with others. There is a tendency to only network locally or within your cause area. However there are real benefits of networking with other charities. When selecting ten organisations to be part of CAF’s pilot programme on resilience, they tried hard to select a varied range of models, causes and geographic areas. However when they got all ten together for the first time and they began to share their challenges, the charities repeatedly commented on how similar they were! • Financially and operationally fit with sufficient income from a diverse range of sources. For example, Charity A receives 90 per cent of its income from grants and Charity B has four types of funding, each representing 25 per cent of income. So far we all know which is the more diverse and less at risk. Or do we? If Charity A has ten grant funders, none of whom represent more than 15 per cent of total income but 25 per cent of Charity B’s income is entirely down to one major donor who could at any point pull out . . . which is the most financially fit? This is the kind of scenario we often see when helping charities to think about diversification. As important as it is to consider "types" of funding, you also have to look at the diversity within these types. Many boards CAF work with do not have a handle on this. • Able to identify and communicate the need that they meet and the impact that they have. Much has been written in the sector about impact measurement, data capture and the like. Most organisations are getting better and better at understanding and capturing the value of their work. However, it’s still fascinating to see the number of charities who share this information with funders only. Neither use it internally to report against their own objectives and outcomes to drive their performance to meet beneficiaries’ needs; nor use this reporting within their annual report. These reports can be a missed opportunity to shout about the need for your services and the amazing difference you make. CAF understand that it’s difficult to focus on organisational health of your charity when you’re busy delivering services but if the charity is unable to bounce back from adversity then it’s your beneficiaries who will suffer. So, why not challenge yourselves by benchmarking your charity against these six characteristics. How well do you think you’re doing? Which pieces do you need to put in place? Beth Clarke is Programme Manager, CAF Resilience and a member of CAF’s Charity Consulting team. Find out how the team could help your charity.